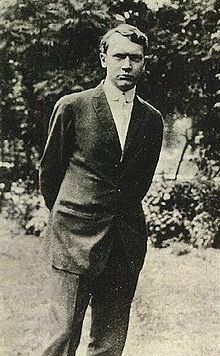 Nicholas Vachel Lindsay (November 10, 1879 – December 5, 1931) was an American poet. He is considered a founder of modern singing poetry, as he referred to it, in which verses are meant to be sung or chanted. I will not be a slave to my yesterday. I am creator, not a parrot. "My star and I, we love thee, little child." Whenever I begin to write a poem or draw a picture I am, in imagination, if not in reality, back in my room where I began to draw pen-and-ink pictures and write verses in my seventeenth year. Both windows of the room look down on the great Governor’s Yard of Illinois. This yard is a square block, a beautiful park. Our house is on so high a hill I can always look down upon the governor. Among my very earliest memories are those of seeing old Governor Oglesby leaning on his cane, marching about, calling his children about him. I am still making my living reciting my verses for crowds who refuse to buy my books. I must do this, as all American rhymers must, however sick I may be of the sound of my own voice. I have sung my songs to my own tunes for most of the English departments of the state universities of the forty-eight states of the nation, and the English departments of other universities and colleges; and I have been recalled to many of these seven and eight times, which matters are a source of great pride to me. And I have brought out three books where the songs were based on my own pen-and-ink pictures. Most years I owe no money and I have no money. Every university pays my way to the next town. That’s about all. No poet has ever made any money out of having his poetry published, and no poet ever will. If the fee is two hundred dollars, it is one hundred dollars for coming to town and one hundred for leaving inside of twenty-four hours. There has been no poetry in the history of the world that has made money for the poet. The New Poetry Movement began when Abel made a more acceptable sacrifice than Cain; but the sacrifice of Abel was not intended as a money-making idea. On the last great day, when Gabriel blows his trumpet, even if he blows it in sonnets, he will not do it for the money that is in it. If he does do it for the cash he will not be Gabriel and it will not be the last great day. It will be a second-rate Hollywood movie of the last great day, and business will continue as usual. The fact that you can write verse is in itself a certificate that you can write prose. Most of the good poetry, as I have said, has appeared in pamphlet form before the poet was known to the public. It is utterly impossible to make an income from verse, and one must win his worldly standing, and earn his living some other way. One of the most distinguished of the Middle Western poets supports himself by writing a movie column once a day. I do not know a poet in the Anglo-Saxon world who makes his living by poetry. Every single one of them makes his living in some other way. Well, how do you know? Did you ever really read them? What do you know about it? Their very names will breathe poetry forever. "The Congo and Other Poems by Vachel Lindsay"
This page was last edited on 24 December 2016, at 17:30.